I found this recipe on one of my favorite fashion and trend blogs, Refinery29, as being a great party appetizer - I agree! Earthy, almost meaty, mushrooms with sweet roasted garlic make this vegetarian option a slam-dunk for any entertaining occasion. Plus, the pungent acidity of vinegar and that wow-factor of truffle oil really elevate this dish to something truly special. Preheat your oven to 350 degrees. Drizzle the bread with olive oil and put on a baking sheet. Bake for 10 minutes on the center rack, flip, and bake for another five minutes or until the bread is crisp and toasted. Turn the oven up to 400 degrees. In a saute pan over a medium flame, add about two tablespoons of olive oil and brown the shallot. Add the mushrooms and a large pinch of salt and pepper. Saute for about 15 minutes, or until the mushrooms are browned and just getting soft. Add the thyme and cook for a minute or two longer. Add the vinegar and stir to combine. Turn off the heat and drizzle with a little truffle oil (a little goes a long way). In the meantime, wrap the peeled garlic in aluminum foil with a tablespoon of olive oil and a pinch of salt, and roast in the oven for about 45 minutes until soft and deep golden brown. 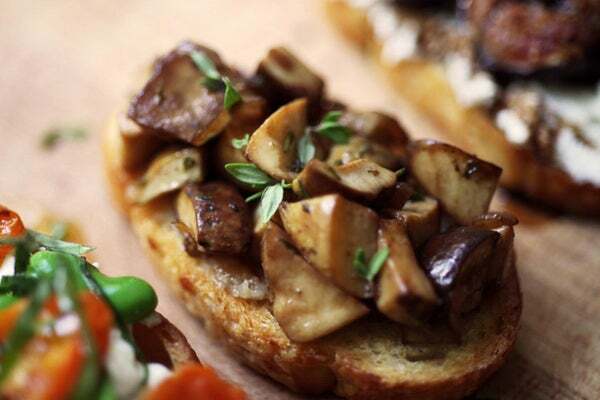 Smear a roasted clove on the crostini and pile with mushrooms. Finish with a few fresh thyme leaves. Wine pairing: 2007 Alois Settimo, $17. The red-cherry hints in this wine is a match made in heaven with the earthiness of the porcini and thyme.